In Room 44 of The National Gallery, Interior which was painted in 1899 is on display. The painting is oil on canvas and in typical Hammershøi style is of his wife Ida and portrays one of the rooms in the old merchant house at Standgade 30, the house which they moved into in 1898. Pencil drawing can be seen through the paint layer and it shows that the table would have filled the foreground being much larger; the figure was then added at the end. 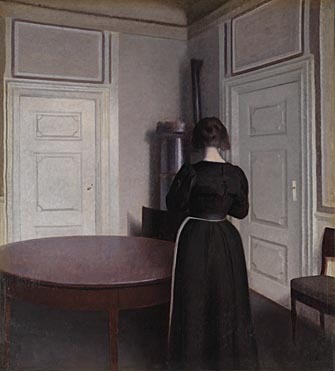 Hammershøi painted the interior of his house more than sixty times – sometimes empty rooms – sometimes including his wife as a model wearing a long black dress. Ida is viewed either from the back or in profile, often reading a book or a letter. All of the artists works prevail a sense of stillness, they very much show the influence of 17th-century Dutch painting.